Jalyn Joule completed 14 of 24 passes for 223 yards and three touchdowns, including a scoring pass to Cherish Carter, for the Longhorns. Kyndal Thorns-Tureaud rushed for 86 yards and a touchdown on 20 carries for Legacy. Coronado 18, Green Valley 12 — At Coronado Kaylin Hall hit Ashley Taibi with a 2-yard touchdown pass in overtime to give the Cougars the win over the Gators. Hall also had a 1-yard TD pass to Kaylee Zicha in the fourth quarter. Zicha caught a 2-yard TD pass from Ashtyn Almeido in the first half. Zicha also rushed for 94 yards on 17 carries for Coronado, and Alexis Washington and Payton Bard each had eight tackles for the Cougars. Green Valley’s Deborah Grant rushed for 168 yards and two touchdowns on 20 carries. Tech 37, Basic 34 — At Tech, Taylor Ritayik threw two touchdown passes and rushed for two touchdowns as the Roadrunners held off the Wolves. Ritayik completed 16 of 25 passes for 228 yards and rushed for 79 yards on 10 carries. Adriana Carrillo and Erin Adarve each caught a touchdown pass, and Gabrielle De Guzman rushed for a score for Tech, which led 21-14 at the half. Las Vegas 33, Eldorado 6 — At Eldorado, Kim Ibarra returned an interception 25 yards for a touchdown to help the Wildcats beat the Sundevils. 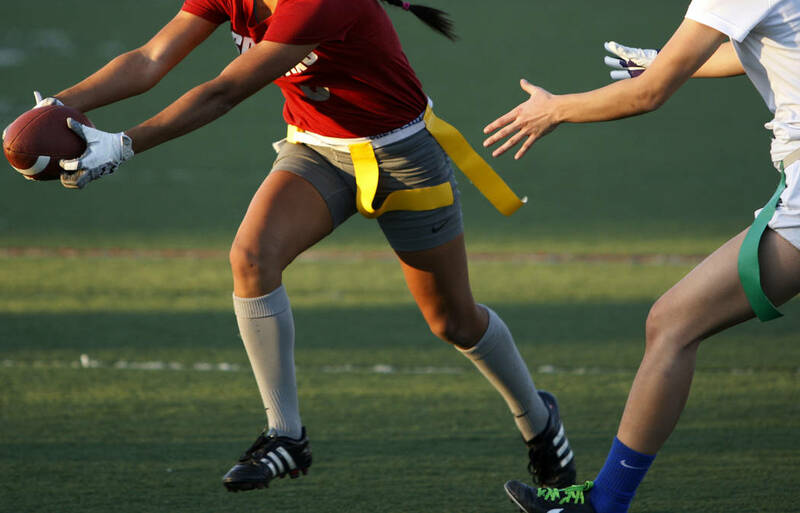 Kaitlyn Horstdaniel completed 19 of 34 passes for 240 yards and four TDs for Las Vegas. Brinkley McCoy had six catches for 88 yards and two scores, and Hailey Rebibes and Aranza Sepulveda each caught a TD pass for the Wildcats. Liberty 20, Foothill 14 — At Foothill, the Patriots defeated the Falcons. Brooke Lynch completed 12 of 25 passes for 182 yards and two touchdowns for Foothill. Whitley Brow caught eight passes for 140 yards and a touchdown, and Viola Farias also caught a TD pass for the Falcons. Canyon Springs 41, Rancho 0 — At Canyon Springs, quarterback Taylor Brown threw five touchdown passes to help the Pioneers blank the Rams. Jaiden Guy had two touchdown receptions for Canyon Springs, and Ja’Nasia Spand, Amaurie Carroll and Ashley Palacios each caught one scoring pass. Carroll added a rushing touchdown, and Spand had three interceptions. Bishop Gorman 43, Pinecrest Academy 0 — At Gorman, the Gaels scored three first-half touchdowns and rolled to the win.